VATICAN CITY (CNS) — True faith is marked by the daring desire to change the world with the loving heart of Jesus, Pope Francis said. The zealous proclamation of the Gospel must never be coupled with “inquisitional clobbering, with condemnation. 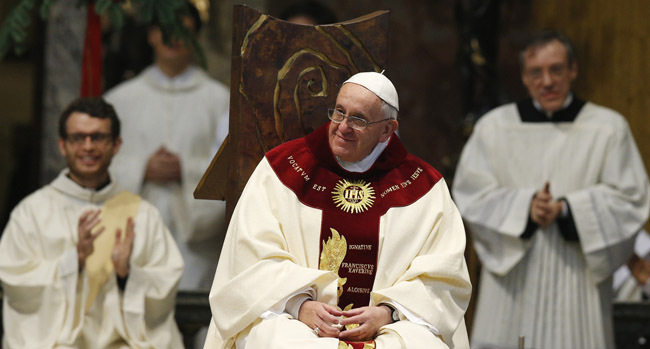 No, the Gospel is proclaimed with kindness, fraternity and love,” he told more than 300 of his fellow Jesuits Jan. 3. The pope celebrated the feast of the Most Holy Name of Jesus at the Church of the Gesu, the Jesuits’ main church in Rome. It was the first Jesuit pope’s third visit as pontiff to the church where St. Ignatius of Loyola and other Jesuit leaders are buried. The Mass was also a celebration of thanksgiving for the recent canonization of St. Peter Faber, who, with St. Ignatius and St. Francis Xavier, was a founding member of the Society of Jesus and the first of the Jesuits to be ordained a priest. In his homily, Pope Francis said that one of things that stood out with St. Faber was his desire to “empty himself” and let Christ fill his heart and life. Instead, people need to remember “the strength of the church does not reside in itself and its organizational abilities, but hides in the deep waters of God,” the pope said. These “deep waters stir up our desires and these yearnings widen the heart,” he said, citing St. Augustine, who saw prayer as a way to fuel the desire to widen one’s heart to God. Only with Christ at the center of one’s life can people go to the ends of the earth for God, he said. 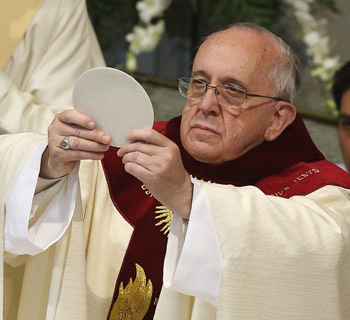 The Jesuits must be willing to empty themselves and feel, think, love, see and walk like Christ, the pope said. “This means doing what he did with the same feelings of his heart,” he said. To avoid losing his way, the pope said, a Jesuit must be “a person whose thinking is incomplete, whose thinking is open, so that he always thinks looking at the horizon that is the always greater glory of God who endlessly surprises us,” he said. The decree, signed on the pope’s birthday, Dec. 17, was an “equivalent canonization,” in which the pope inserts the name of the new saint in the universal calendar of saints without verifying a miracle performed through his intercession and without holding a formal canonization ceremony.